Earning College Credit in High School Katy ISD offers three methods by which students may obtain college credit while in high school. 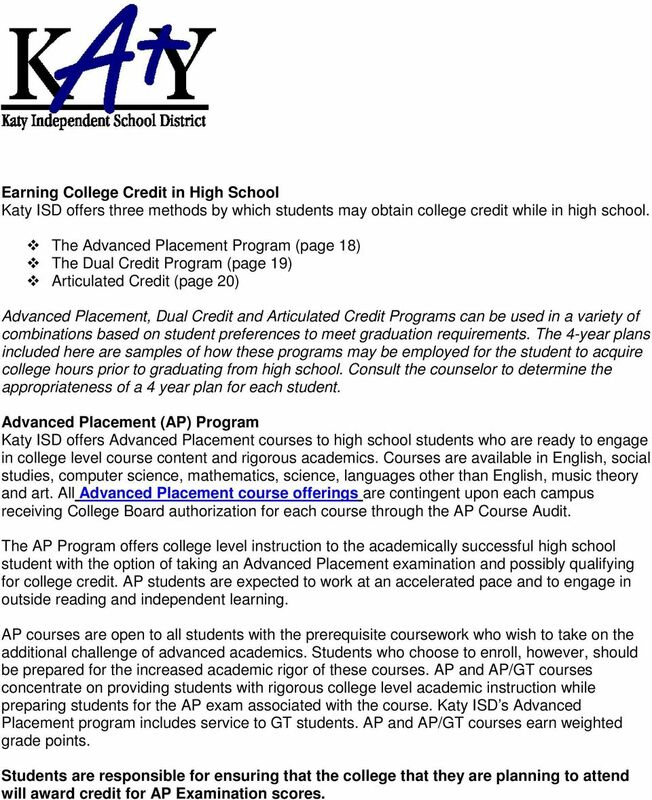 Download "Earning College Credit in High School Katy ISD offers three methods by which students may obtain college credit while in high school." 1 Earning in High School Katy ISD offers three methods by which students may obtain college credit while in high school. 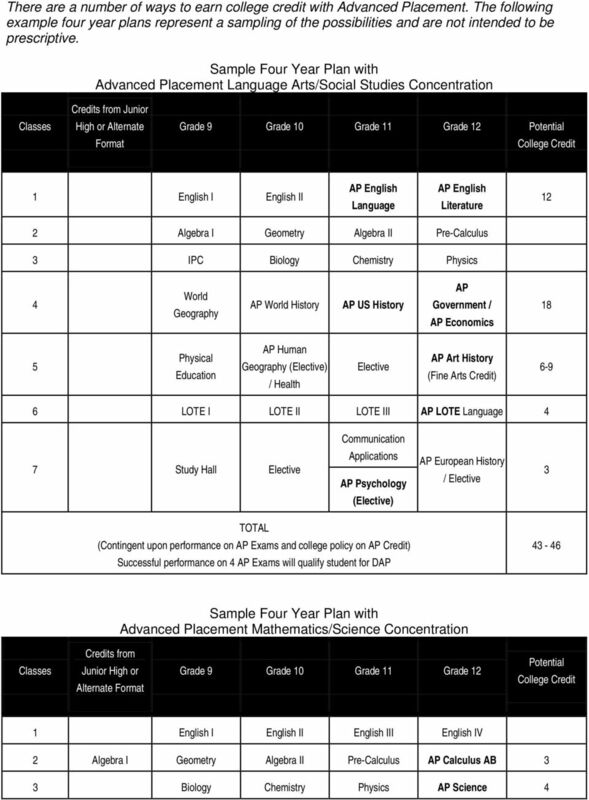 The Advanced Placement Program (page 18) The Program (page 19) Articulated Credit (page 20) Advanced Placement, and Articulated Credit Programs can be used in a variety of combinations based on student preferences to meet graduation requirements. The -year plans included here are samples of how these programs may be employed for the student to acquire college hours prior to graduating from high school. Consult the counselor to determine the appropriateness of a year plan for each student. Advanced Placement (AP) Program Katy ISD offers Advanced Placement courses to high school students who are ready to engage in college level course content and rigorous academics. Courses are available in English, social studies, computer science, mathematics, science, languages other than English, music theory and art. All Advanced Placement course offerings are contingent upon each campus receiving College Board authorization for each course through the AP Course Audit. The AP Program offers college level instruction to the academically successful high school student with the option of taking an Advanced Placement examination and possibly qualifying for college credit. AP students are expected to work at an accelerated pace and to engage in outside reading and independent learning. AP courses are open to all students with the prerequisite coursework who wish to take on the additional challenge of advanced academics. Students who choose to enroll, however, should be prepared for the increased academic rigor of these courses. AP and AP/GT courses concentrate on providing students with rigorous college level academic instruction while preparing students for the AP exam associated with the course. Katy ISD s Advanced Placement program includes service to GT students. AP and AP/GT courses earn weighted grade points. Students are responsible for ensuring that the college that they are planning to attend will award credit for AP Examination scores. 3 Course History US History Government/ Economics / Health AP Computer Science A () Fine Arts Credit 3 6 LOTE I LOTE II LOTE III AP Statistics 3 7 Study Hall Semester AP Science Course (Contingent upon performance on AP Exams and college policy on AP Credit) Successful performance on AP Exams will qualify student for DAP 17 The Katy ISD Program The Program is a fee-based cooperative effort between Katy ISD and Houston Community College System. 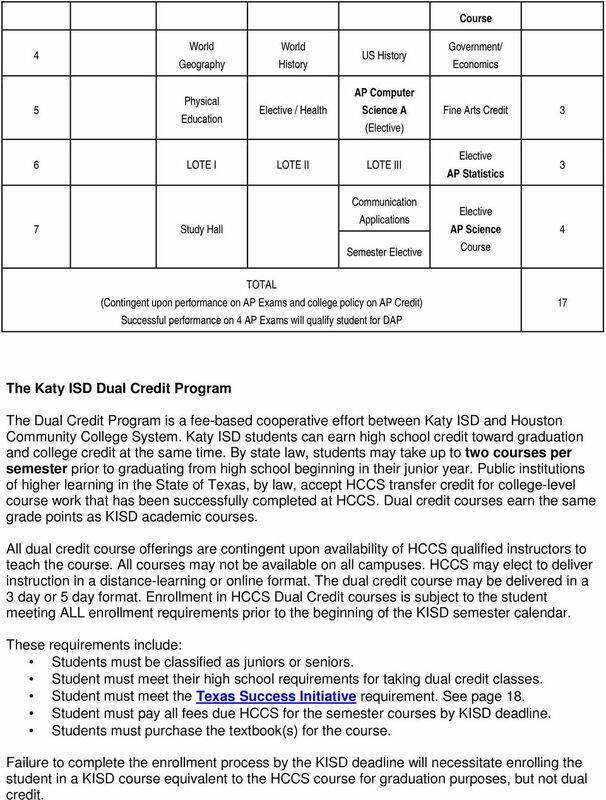 Katy ISD students can earn high school credit toward graduation and college credit at the same time. By state law, students may take up to two courses per semester prior to graduating from high school beginning in their junior year. Public institutions of higher learning in the State of Texas, by law, accept HCCS transfer credit for college-level course work that has been successfully completed at HCCS. Dual credit courses earn the same grade points as KISD academic courses. All dual credit course offerings are contingent upon availability of HCCS qualified instructors to teach the course. All courses may not be available on all campuses. HCCS may elect to deliver instruction in a distance-learning or online format. 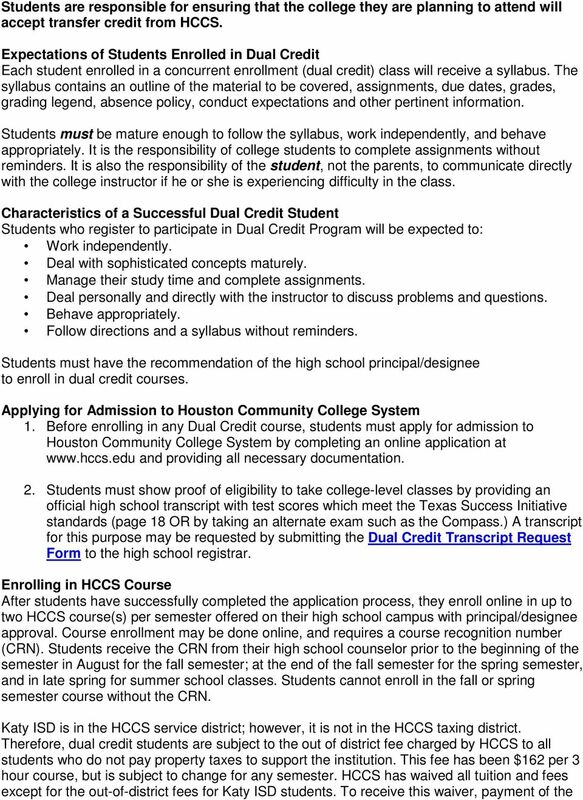 The dual credit course may be delivered in a 3 day or day format. Enrollment in HCCS courses is subject to the student meeting ALL enrollment requirements prior to the beginning of the KISD semester calendar. These requirements include: Students must be classified as juniors or seniors. 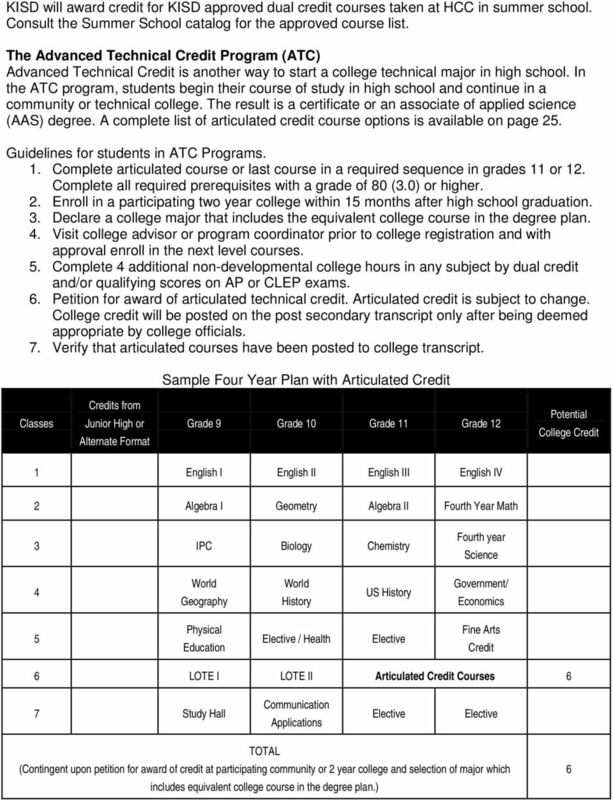 Student must meet their high school requirements for taking dual credit classes. Student must meet the Texas Success Initiative requirement. See page 18. Student must pay all fees due HCCS for the semester courses by KISD deadline. Students must purchase the textbook(s) for the course. 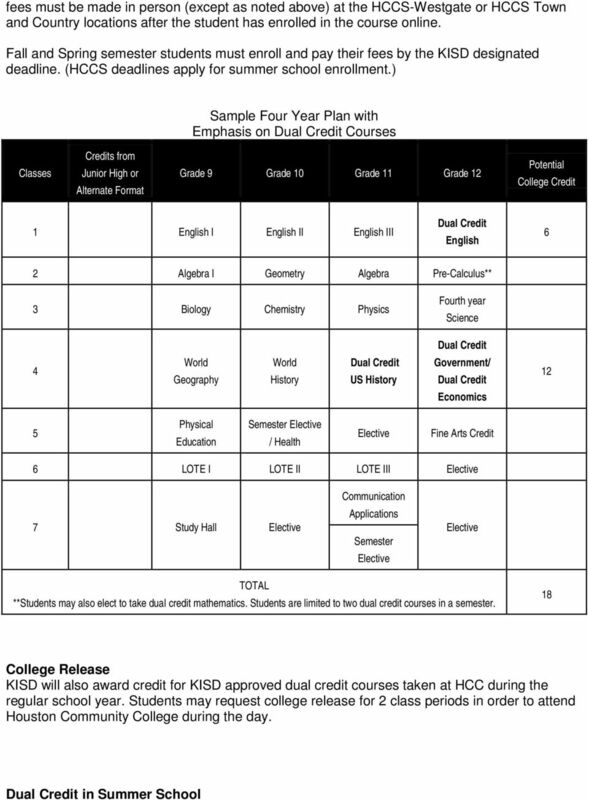 Failure to complete the enrollment process by the KISD deadline will necessitate enrolling the student in a KISD course equivalent to the HCCS course for graduation purposes, but not dual credit. Dear Parent/Guardian, I hope you are having a wonderful spring. It s difficult to believe that we are more than 75% through this school year, and before we know it, your student will be a senior at BHS! Review your plan of study each year after adjusting to the current course schedule. FOUR-YEAR PLANNING STRATEGIES TO MAXIMIZE COLLEGE CREDIT EARNED IN HIGH SCHOOL! Lehi Jr. High Counseling Dept. Undergraduate Transfer Credit Policy Students who wish to be considered for transfer admission to American University (AU) must be in good academic and social standing at the school previously attended. Campuses shall follow the current NCA Higher Learning Commission guidelines in awarding prior learning credit. Arizona General Education Curriculum (AGEC) for Casteel High School. Prepared by the Dual Enrollment Department cgc.edu/dual 480.732. GRADUATION REQUIREMENTS FOR THE ALABAMA OCCUPATIONAL DIPLOMA This diploma is available for student with disabilities as defined by the Individuals with Disabilities Education Act (Public Law 101-576). An interview may be required as the Office of University Admissions attempts to evaluate each student s ability to complete a program at NJIT. Allows students (grades 7 12) to earn transcripted credit for college courses while in high school.